Join us at IHOP on February 27 to celebrate National Pancake Day! Treat yourself to delicious buttermilk pancakes and help kids treated at our hospital. Stop in at participating IHOP locations with your friends and family on February 27 to celebrate National Pancake Day and make a donation to Kapiolani Medical Center. Purchase a Miracle Balloon at participating IHOP locations now through February 27. Miss Hawaii 2016, Allison Chu, volunteers at IHOP by reminding customers to donate to Kapiolani Children’s Miracle Network. Children’s Miracle Network Hospitals funds support various patient-centered programs at Kapiolani Medical Center for Women & Children. Programs include Child Life, chaplaincy, and transport team. Funds are also used to provide necessary equipment, such as, state-of-the-art incubators for the Neonatal Intensive Care Unit. 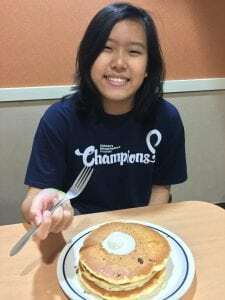 Previous post: IHOP to help local sick and injured kids! Next post: IHOP National Pancake Day 2018!